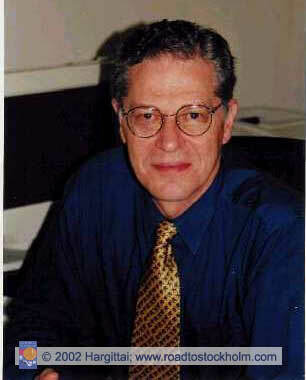 The following are pictures related to the book's content. The first two are featured in the book which has a total of 60 photographs in it. 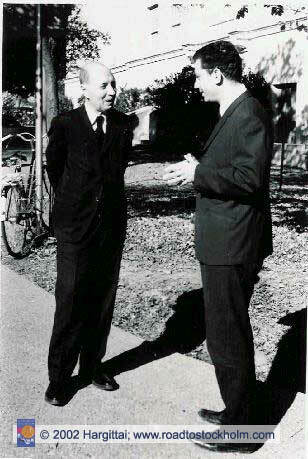 Then follow additional photographs that are only available on this Web site. 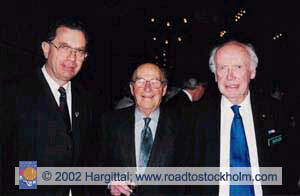 Don't miss the pictures from the 2001 Centennial Ceremonies. 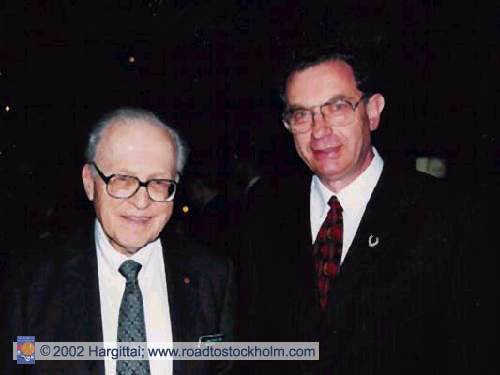 All photos © 2002 István and Magdolna Hargittai. 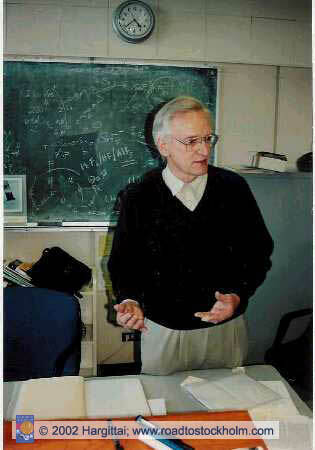 Neil Bartlett, Berkeley, 1999 (photo by I. Hargittai). 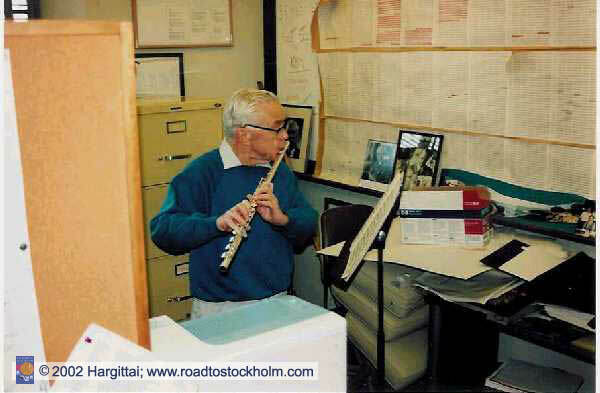 Günter Blobel (M99), New York City, 2000 (photo by I. Hargittai). 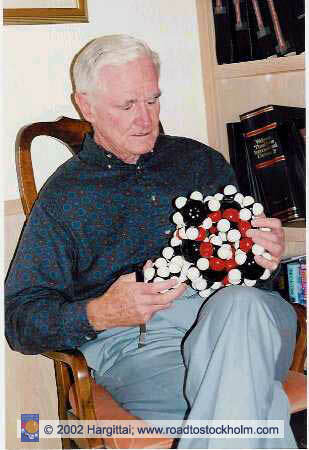 Donald Cram (C87), Palm Desert, 1995 (photo by I. Hargittai). 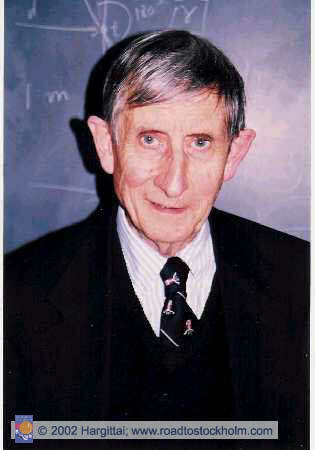 Freeman Dyson, Princeton, 1999 (photo by M. Hargittai). 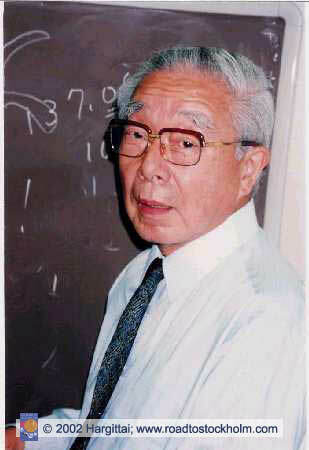 Kenichi Fukui (C81), Kyoto, 1994 (photo by I. Hargittai). 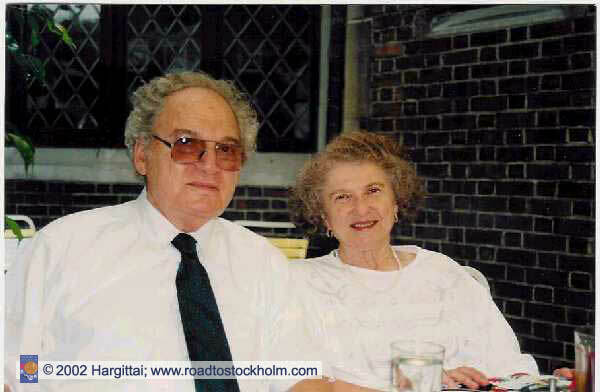 Herbert Hauptman (C85) and Edith Hauptman, Buffalo, 1995 (photo by I. Hargittai). 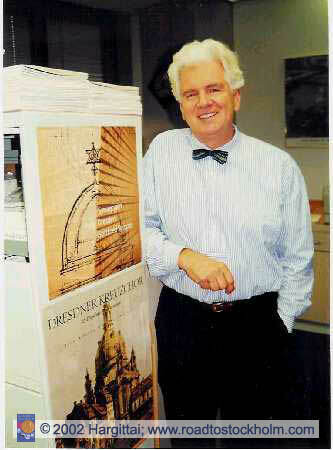 Russel Hulse (P93), Princeton, 1999 (photo by M. Hargittai). 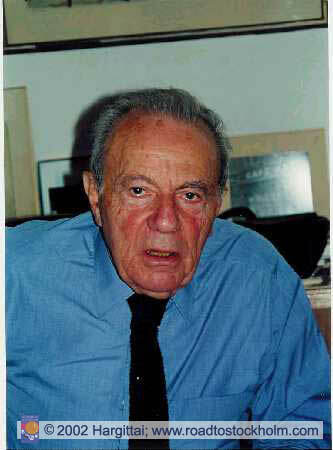 Francois Jacob (M65), Paris, 2000 (photo by I. Hargittai). 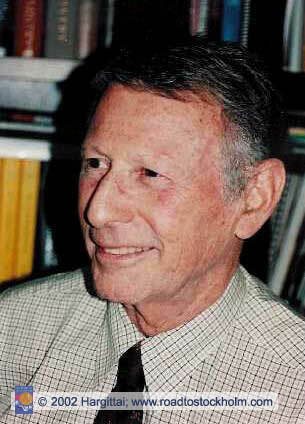 Edward Lewis (M95), Pasadena, 1999 (photo by I. Hargittai). 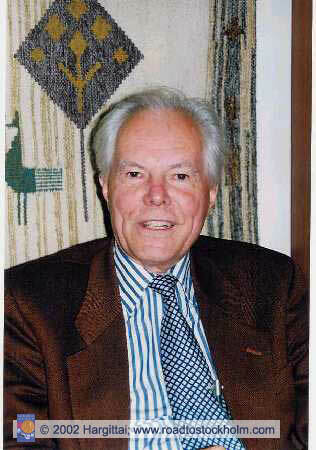 Rudolf Mössbauer (P61), Budapest, 1995 (photo by I. Hargittai). 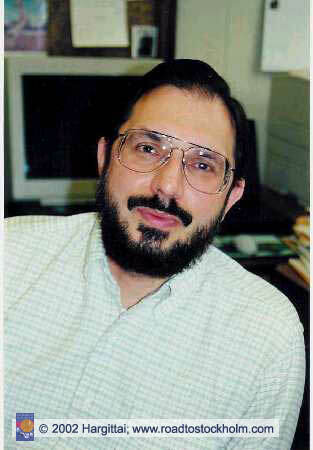 Frederick Robbins (M54), Cleveland, 2000 (photo by M. Hargittai). 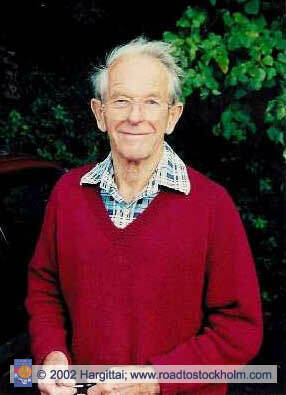 Frederick Sanger (C58, C80), Cambridge, 1997 (photo by I. Hargittai). 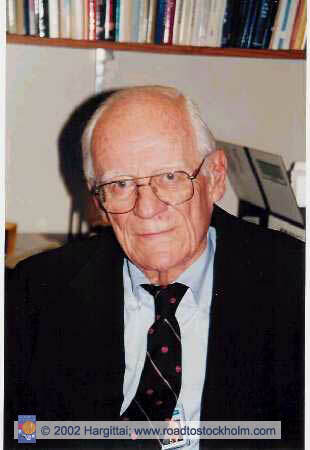 Joseph Taylor (P93), Princeton, 2000 (photo by M. Hargittai). 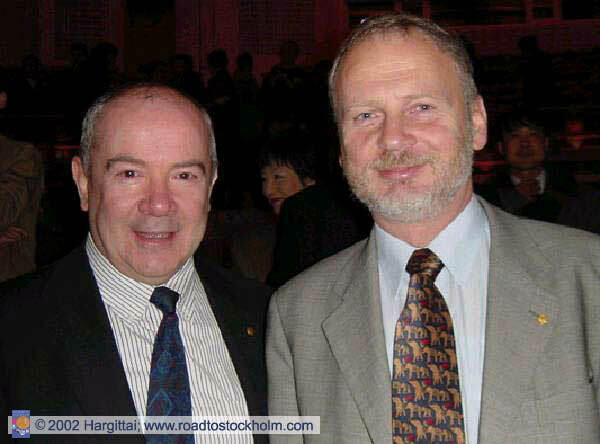 The 2001 Nobel Prize award ceremony in the Stockholm Concert Hall. 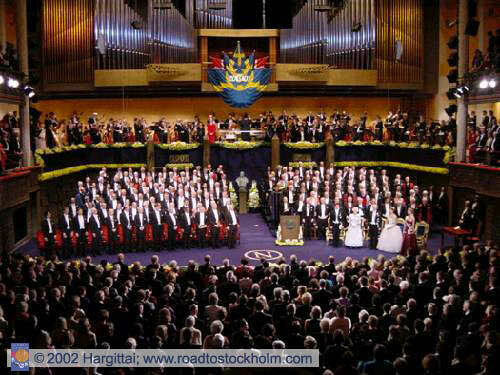 In the front row on the left, the 2001 Nobel laureates, from left to right, the three physics laureates, the three chemistry laureates, the three laureates in physiology or medicine, the literature laureate, and the three laureates of the Nobel Memorial Prize in Economics. In the front row on the right, the Royal Family. Behind the front rows, the Nobel laureates of previous years. 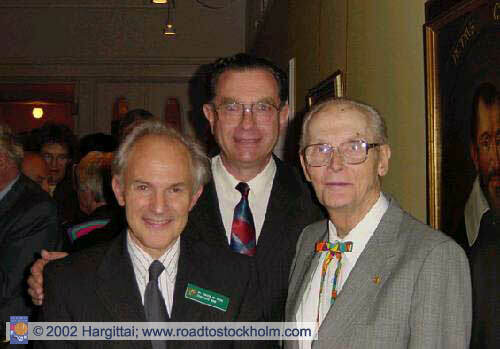 Harry Kroto (C96), István Hargittai, and William Lipscomb (C76) [all three are Kentucky Colonels] at the reception of the Royal Swedish Academy of Sciences. 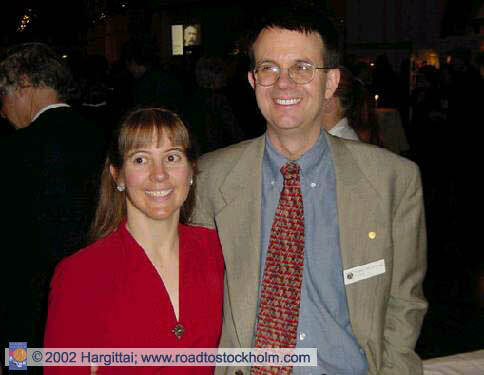 Eric Cornell (P2001) and his wife at the reception of the Nobel Foundation. 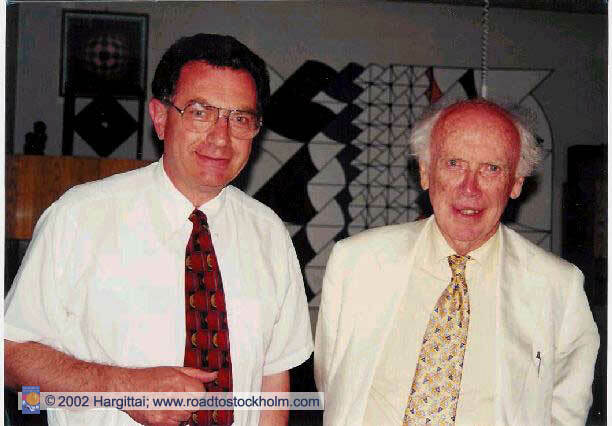 Johann Deisenhofer (C88) and Hartmut Michel (C88) at the reception of the Nobel Foundation. 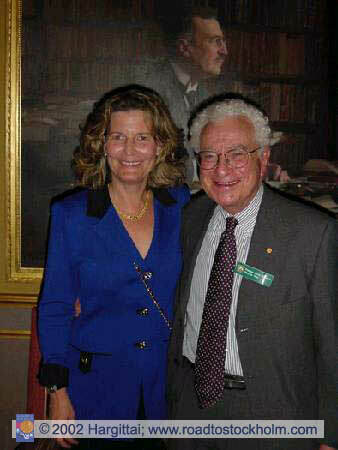 Murray Gell-Mann (P96) and his wife at the reception of the Royal Swedish Academy of Sciences. 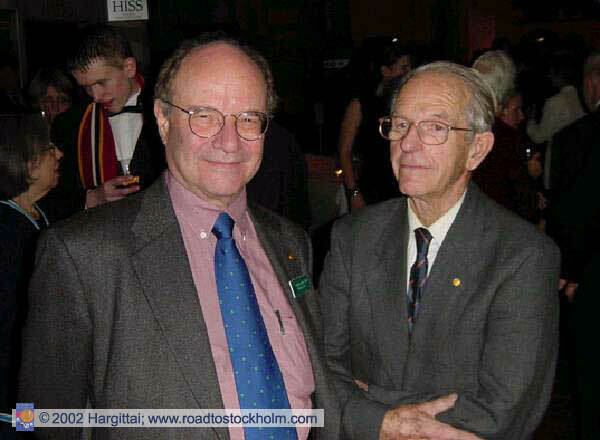 Walter Gilbert (C80) and Frederick Sanger (C58 and C80) at the reception of the Nobel Foundation. 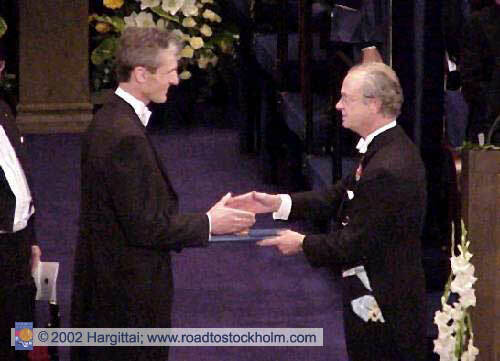 Wolfgang Ketterle (P2001) receiving the Nobel Prize from teh King of Sweden. 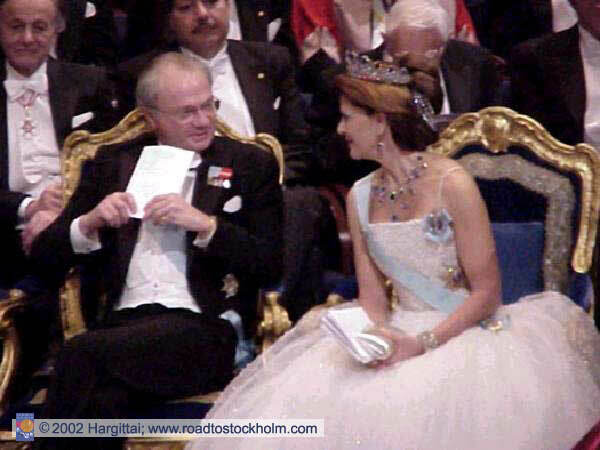 The King and Queen of Sweden during the award ceremony. 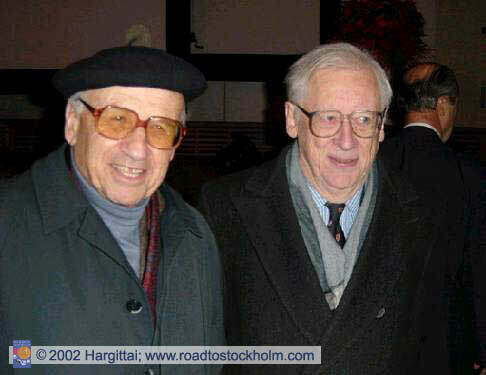 Walter Kohn (C98) and John Pople (C98) after the 2001 Chemistry Nobel lectures. 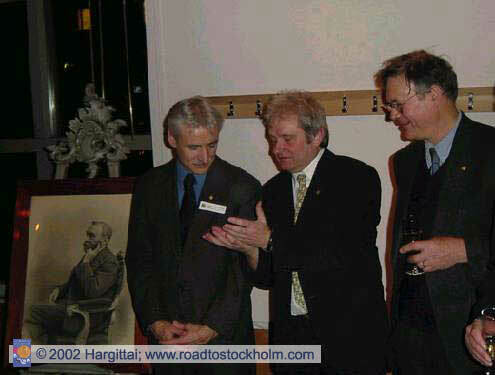 The three laureates of the Nobel Prize in Physiology or Medicine for 2001 at the reception of the Karolinska Institute. 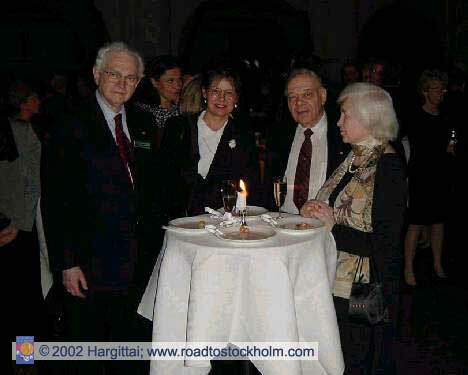 Marshall W. Nirenberg (M68), Magdolna Hargittai, Jerome Karle (C85) and Iabella Karle at the reception of the Nobel Foundation Marshall Nirenberg (M68) and Magdolna Hargittai at the reception of the Nobel Foundation. 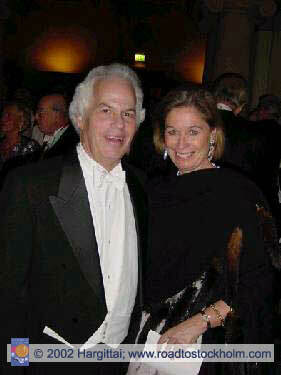 Stanley Prusiner (M97) and his wife at the Nobel Banquette.